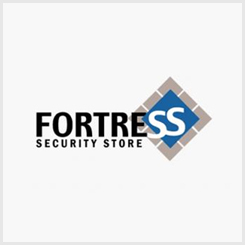 Fortress Security Store offers a variety of sensor options. We can help to protect your home or business from burglars, fires (through detection of smoke), gas leaks, and water leaks. internal Antenna Sensor design allows for easy installation in a variety of circumstances. If you are looking for an inexpensive customizable system you've come to the right place. Mounting equipment such as sticky tape, screws, and wall brackets are included, so installing your Fortress security system has never been easier! There's no need to pay an installation fee, and if you need assistance, we have videos and other excellent resources available online. Our Support Representatives are also available 7 days per week. 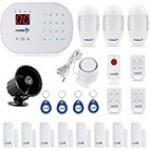 Fortress security systems are capable of supporting multiple wireless accessories, and adding one or more accessories after the original purchase is quick and easy. Many accessories are also compatible across systems, so upgrading to a system with more features is also a breeze. If you're not sure which system is best for you, you can always upgrade when the time is right. When your system is configured and connected for remote access, you can control your security system remotely. 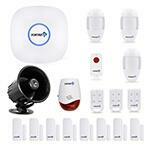 Do you have house guests, cleaning staff, or security personnel who need to get inside without triggering the alarm? Disarm or re-arm the system at the push of a button. You won't need to share your system's password with anyone. Other alarm systems with monitoring service require a test mode or a call to the monitoring provider to avoid additional fees or police response. With our systems, testing is as simple as removing your telephone connection from the main panel. Sirens can also be unplugged to avoid bothering the neighbors while you test. Since your Fortress system will still work as a local alarm with no monthly fees or contracts required, your wallet will thank you for the extra savings each month. When your house will be empty, you can arm the system in "Away Armed" mode for maximum protection and coverage. When you're at home or sleeping, you can arm the system in "Home Armed" mode. This will keep the perimeter secure (doors and windows armed) while allowing you to get up, and move around inside the house (motion detectors disarmed). Getting a late night snack won't wake up the whole house! Our security systems are great for small businesses, as well! They are easy to install no matter where you need to use them. With optional self-monitoring available, you can ensure you'll be notified in the event of a triggered alarm. Have a large warehouse or bigger building that needs to be protected? We offer optional signal repeaters to increase the wireless range of the accessories. Whether you have a 10,000 sq. foot warehouse or a several acre industrial equipment complex, we can help. 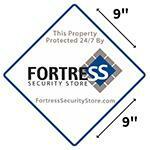 Fortress Security Store is very proud of the quality of the products we sell. We are so confident in the quality, we guarantee the main panel and accessories will function normally for at least 3 years. If anything should happen to malfunction or otherwise cause a problem, just call us and we'll help you fix the item. If we can't get things back to normal operation, we'll replace the offending sensors or panel and pay for the shipping. See our Warranty page for full details! Transmitter Dimensions: 2.75" x 0.5" x 1.25"
Vibration Sensor Dimensions: 2.25" x 0.75" x 0.625"
The Fortress Vibration sensor is operated by a 23A battery. This sensor can detect the vibration of an attempted forced entry. Installation is simple when using the included double sided sticky tape. When installing make sure the vibration sensing portion of the unit resembles an M or a W.
A motion detector will sense any movement in a room. If the beam that the motion detector sends out is interrupted, a signal will be sent to the main control system, triggering the alarm. Monitoring activity in a room is important if an intruder manages to bypass the basic trigger points of the window and door contacts. Dimensions: 4.625" x 2.25" x 3"
The Fortress Gas leak detector has a built in 85DB alarm and will also trigger your alarm systems call features and sirens. This device will detect most combustible gasses. Weather you program it to the system or just have it for piece of mind, this device is a great addition to any system. Sensor Dimensions: 2.75" x 0.5" x 1.25"
Float Dimensions: 1.5" x 0.75" x 0.75"
The Fortress Water Leak sensor is a flotation style sensor. When water is present the bobber will lift and trigger the sensor. These devices require approximately 1/8th of an inch of water to trigger. Water sensors are powered by a 23A battery. Installation of this sensor typically utilizes double sided sticky tape. The flotation portion of the sensor hangs below the sending unit, resting on the ground. In the event of a water leak the float will raise, triggering an alarm. Dimensions: 11.5" x 2.5" X 7.25"
The fortress Solar siren is a 130DB strobe siren that requires no power connections. If you have a situation where you need to locate a siren in a more remote area that does not have a power source, this is the siren for you. The internal backup battery is charged by the solar panel to keep this siren powered all the time. A full charge on the battery will last about 48 hours with no sunlight. Indirect sunlight is not a problem and is capable of charging the battery making this a versatile Siren. Dimensions: 4" x 2.625" x 1"
The Fortress Plugin Siren is an 85DB siren that plugs directly into a power outlet. This unobtrusive siren is a great option for adding extra sound to a location without making it super obvious. 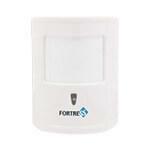 Dimensions: 3.5" x 1" x 2.5"
Dimensions: 2.25" x 1.75" x 2"
The Fortress Indoor siren plugs directly into the main panel. At 130db you will be sure to deter any would be burglar. The Fortress Panic button serves to trigger an alarm with 1 easy push of a button. 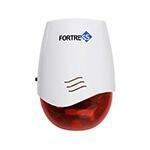 Dimensions: 6" x 1.5" x 3.5"
The Fortress Indoor/Outdoor Strobe siren is loud at 140db. This siren plugs into AC power for its primary source and has a rechargeable backup battery. With the flashing light and incredibly loud siren, you are sure to draw attention to your secured location, should someone decide to break in. The Fortress RFID Keypad is a secondary keypad used to arm and disarm the security system. RFID tags allow disarming with nothing more than a swipe of the tag. Tags only work for disarming. Arming from the RFID Keypad will require a password. This keypad is battery operated and uses 3AAA batteries. 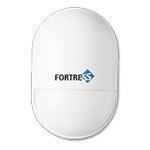 The Fortress Indoor/Outdoor wireless siren is quite loud at 130Db. Wireless communication with the main panel allows you to locate the siren up to 150 feet from the main panel. This device requires an AC outlet for power. 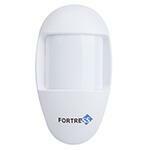 Dimensions: 3.75" x 1.75" x 2.75"
The Fortress Pet Immune motion sensor is a Passive Infrared Motion sensor that will ignore most pets up to 50Lbs. This style of sensor is ideal for homes with small dogs or cats. Pet immune sensors are powered by a 9V battery. Installation is simple. The sensor has a 3 piece mounting bracket that snaps together and hangs on the wall with 2 screws that are included with the sensor. The Fortress Smoke Detector will trigger your alarm system to call you in the event of a fire. It uses a photo Electric style sensor to detect the smoke. These devices are powered by a 9V battery. This sensor comes with a mounting bracket and screws making installation very easy. Dimensions: 2.5" x 0.25" x 1.5"
The Fortress Remote control Keyfob is used to Arm in the home or away mode, Disarm the system and Trigger panic alarms. With a range of 150 feet, you can disarm your system before entering the building. Remote control Keyfobs are powered by a 23A battery. The Fortress Outlet allows you to control the power to any electronic item plugged into it remotely. Up to 20 outlets can be controlled by 1 main panel with automated timers available to turn the devices on or off on a schedule. 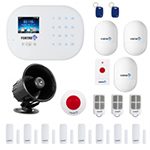 The Fortress S03 system uses a Landline or VOIP connection to dial up to 6 numbers in the event of a triggered alarm. With 32 zones and support for up to 99 sensors, this system is very versatile. Whether you choose a preconfigured kit or decide to build your own system, the S03 panel is a great way to secure your home or business. The built in backup battery will keep the S03 system powered for up to 72 hours in the event of a power failure. If you are interested in a simple to use straightforward system, the S03 is for you. The Fortress Wireless Doorbell features a clean, simple design and lets you select from up to 50 different tones and melodies. Simply plug the speaker unit into a wall outlet and mount the doorbell button at the desired location with the included double sided adhesive, no wiring needed! Easily select a tone and adjust the volume with the buttons on the side. When the doorbell button is pressed, the unit will playback the tone you have selected and flash the blue circular light. You can also pair wireless sensors compatible with our S03 and GSM alarm systems to the doorbell. When the sensor is triggered, the speaker unit will playback the tone. You may set different tones for each sensor and even the doorbell button, letting you know exactly where a door has been opened or motion has been detected. The sensors can be paired with an S03 or GSM system and the doorbell as well. 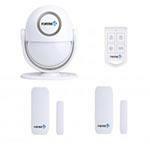 Use the sensor with the doorbell during the day and your alarm system at night! Unobstructed wireless range is 500 feet.